Image: People in the dry bed of the river Sorgue at Fontaine de Vaucluse, France. Springs are not underground, that's true. 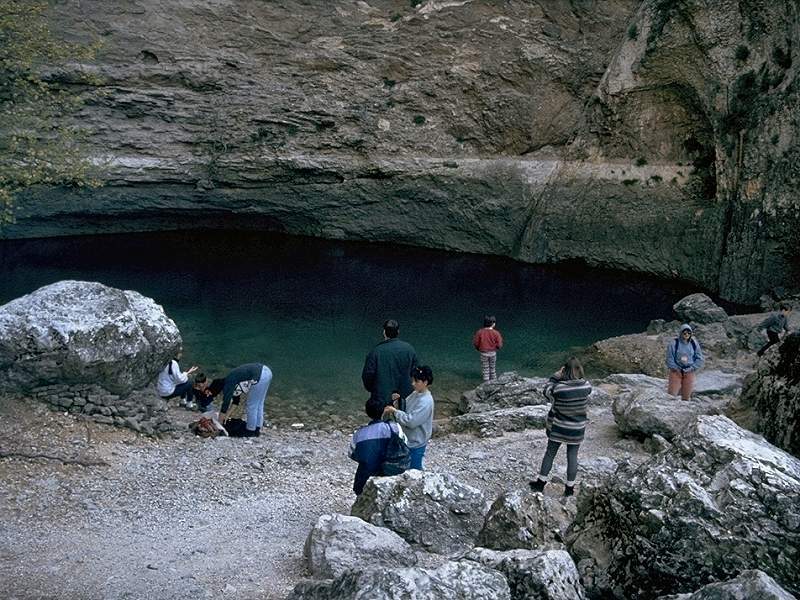 But many - not all - springs have a strong connection to caves, they are a typical, maybe the most impressive karst feature! 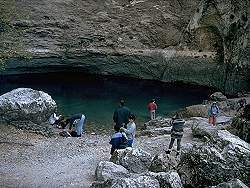 The springs we describe here are karst springs, which means, they have connection to a karst area, are the drainage of the ground water body of this area. In most cases there is a cave behind the spring, and here is our connection to the subterranean world! Famous cave divers all over the world explored the caves behind the springs, one of the most dangerous things to do! Many caves have been discovered behind springs, and many diveres died doing so. But despite the dangerous caving, visiting a beautiful, romantic spring is always a nice thing to do. More impessing is the visit during high flow, when the water roars out of the cave. The Geology of Karst Springs. Index of Springs described on showcaves.com. Index of Springs grouped by country.